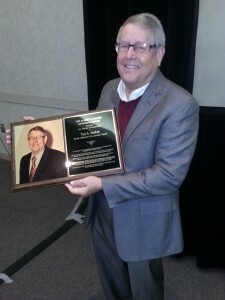 The Albert G. Salter Memorial Award was presented to Ted A. Batkin in recognition of his leadership and accomplishments during his 20-year tenure as President of the Citrus Research Board (CRB) from 1993 to 2013. Don Roark, who serves as a director for both CCQC’s and CRB’s Board of Directors, presented the award at CCQC’s annual conference on October 10, 2013 in Visalia. The award is in recognition of outstanding individuals or accomplishments for the betterment of the citrus industry. Roark highlighted Batkin’s leadership, management and organizational skills. Under Batkin’s guidance, the Citrus Research Board has evolved into an internationally respected gold standard research program that has made significant strides in finding solutions to huanglongbing (HLB) and other devastating citrus diseases, including developing early detection and diagnostic technologies. In response to the introduction of the Asian Citrus Psyllid in California in 2008, Batkin played an instrumental role in creating a pest and disease control program within the CRB and created a state-of-the-art diagnostics laboratory in Riverside. He has embraced new areas of science, new collaborators, and longer term solutions to problems. He has energetically communicated the relevance of the issues and the potential solutions to the grower community. His dedication, passion for California agriculture and his vision to recognize and help the industry react to threats of invasive pests have earned him the respect and gratitude of the entire California citrus industry.